The Taipei International TV Market & Forum, Taiwan's largest annual TV rights trading event, closed successfully on Nov. 15 after hosting visitors from 24 nations and regions and facilitating an estimated US$13 million in deals. Forum organizer Bureau of Audiovisual and Music Industry Development noted that the 9th edition of the Taipei TV market saw participation from 24 nations and regions, including 75 international buyers, representatives of 74 Taiwanese audiovisual operators, 263 television and film productions, and 900 matchmaking and investment negotiations. First-time attendees included those from Iran, Spain, and Norway, the Bureau pointed out, adding that buyers from Southeast Asia accounted for 53% of the international purchasing representatives. An initial sales estimate is given at US$13 million upon the conclusion of the three-day event, with a projected total revenue of US$26 million, or roughly NT$8 million, from post-event negotiations and follow-ups. The Bureau also thanked the officials from trade offices and diplomatic missions in Taiwan representing France, Hungary, Kiribati, Poland, and Spain, as well as those representing Iranian company Tva TV and Norway's Northern Film Group for attending the opening gala on Nov. 13. 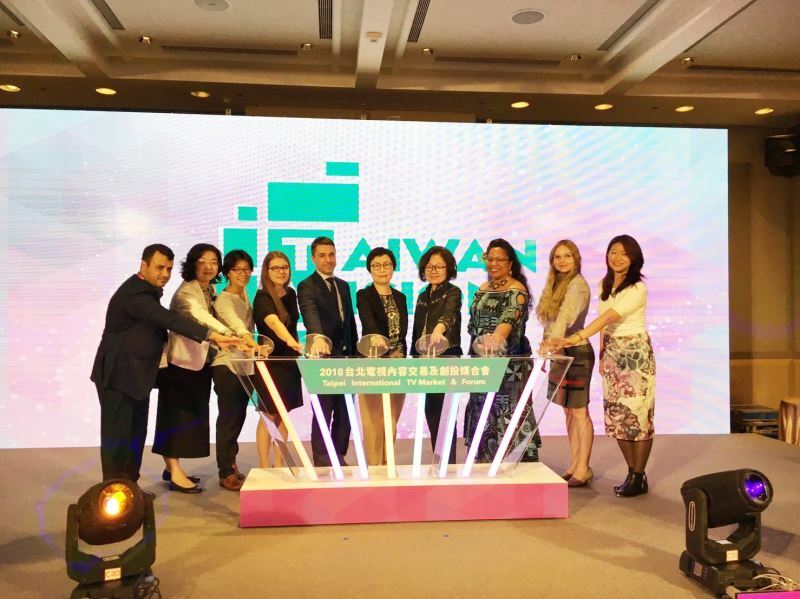 Deputy Minister of Culture Celest Ting pointed out that audiovisual content is a critical indicator of a nation's cultural brand, and that the Ministry of Culture seeks to bring forth a renaissance of original cultural content in Taiwan. The Taipei TV market plays a key role in the Bureau's objectives of promoting cross-border cooperation, constructing an important exchange platform that will become an intrinsic part of the cultural industry ecosystem, and weaving connections with the international market. The 2018 edition in particular enjoyed the enthusiastic participation and support from partners from many different creative sectors, including well-known television and documentary producers from Taiwan and abroad, innovative TV content creators, and heavyweights from the publishing, post-production, VR/AR, and software sectors. We would like to express our sincere gratitude to you for taking time from your busy work schedule to attend. Your participation brings us encouragement and motivation, and has added to the color and brightness of this grand happening. We will continue to enthusiastically endeavor to provide the best in service to both domestic and overseas enterprises, increase international exchange opportunities, and assist in marketing Taiwan television works overseas, creating ever more commercial opportunities for the Taiwan television content industry. Visitors Today:145. All Time Visitors:1,229,952.